This article was originally published by Swiss street paper Surprise and was shared on the INSP News Service. In Somalia, Ali Nur Mohamed (60) was a veterinarian and director of a Swiss NGO. But after a horrific grenade attack by the terrorist group Al-Shabaab, in which he lost his right leg, he fled to Switzerland with his wife and five of their six children. 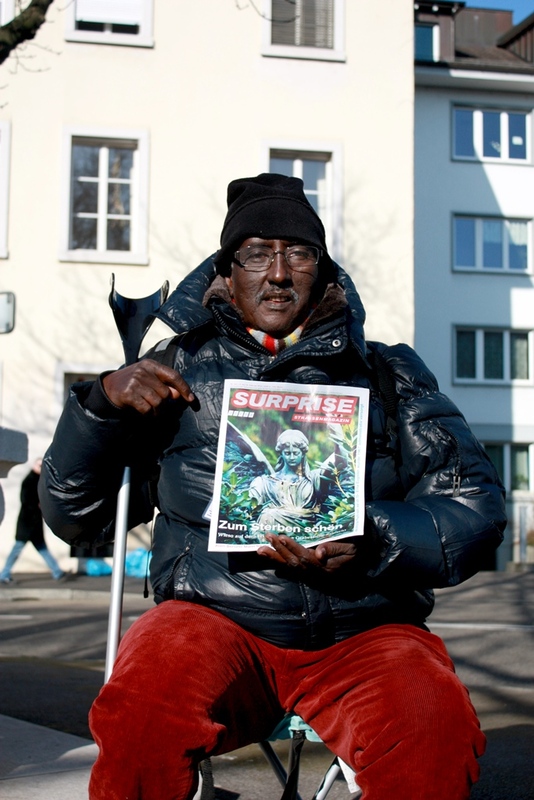 He now makes a living selling Surprise in Basel. He says it is a miracle that he is still alive. I often think of my previous job and the responsibility I had there. Today I stand in the street and sell newspapers. That’s something completely different. But I enjoy selling the street paper. I’d rather look forward in life than look back. I’ve been in Switzerland since 2012. The time before that was turbulent. In my home country, Somalia, I did a degree in veterinary medicine and later worked for international and local NGOs, including a period as Regional Director for West Somalia. I had a good job with lots of responsibility until the civil war broke out. From then on, the terrorist group Al-Shabaab spied on me every day. They thought I was a spy working for the USA. I feared for my life. Lots of my colleagues were shot and killed. Then one night they stormed my house, too. Fortunately my family wasn’t at home at the time. They attacked with grenades. I lost my right leg and my whole stomach was hanging out of my body. I pretended to be dead. They thought I’d died in the attack, and they fled. In total I had 17 iron splinters from a grenade in my back. I barely survived. I was in hospital for seven whole months and was in a coma for a long time. If I hadn’t pretended to be dead, I wouldn’t have survived. In 2012 the Swiss NGO for whom I’d worked for a long time in Somalia brought me to Switzerland. My wife followed me, and since last November five of my children have also been living in Basel. But unfortunately my eldest son is still in Somalia. Because he’s already grown-up, the Swiss authorities didn’t let him into the country. For my wife and me it’s very hard to know that he has no future in our homeland. I don’t think he’ll ever be able to come to Switzerland, although we really want him to. My family and I share a small, three-room apartment. In the future I’d like to get a bigger apartment, then all seven of us would have more space. All my children go to school. That’s very important to me. My wife also sells Surprise, and we’re both taking a German course. Learning the language is very important for integration. I speak four languages: Somali, Arabic, Italian and English. But learning German at my age is not that easy. I always sell the paper on Fridays and Saturdays. Some people come especially to buy Surprise from me. That gives me a good feeling. It’s also my sales strategy. I’m trying to build as big a customer base as possible. Already, friends of friends buy the paper from me, and so it goes on. The most important thing is to be friendly and not to wear a grumpy expression. I always say “Guten Tag” nicely. Lots of customers are really interested in me and my story. That makes me very happy. The Swiss women are all especially nice. It’s very important to us to be properly integrated, because life in Switzerland is our future. What worries me most is my health. Since the attack in Somalia I wear a prosthetic leg that hurts a lot. I can only walk with great difficulty, as the prosthetic weighs 15 kilos. I applied to my health insurance for a lighter, more modern prosthetic, but the application was turned down for cost reasons. But the cold causes me problems too. We’re only allowed to sell the paper outside. After a certain time I can’t feel my fingers anymore. In the summer it’s much better. I often think of the past, of the night of the grenade attack and its consequences. It’s sometimes very hard when those memories arise. And it happens very often. One day, I’d like to return to Somalia, as long as it’s safe. It’s not easy to start again from nothing. But we managed it here in Switzerland, after we’d lost everything in Somalia. And that makes me happy. As told to Claudia Spinnler, translated by Jane Eggers.